Thanks everyone for your kind comments. My boss let me leave my work trip because I was so sick, Josh came to my rescue. I am feeling better, not great, but better. Thanks again for all of your well wishes. We enjoyed Easter dinner at the Dewey’s this year. They are not technically family, but close enough:) They always include us in their family events, they are too good to us! We had a huge feast on Easter: Honey Baked ham, roasted asparagus, fresh green beans, salad, fresh fruit, sweet potatoes, and orange rolls. Everything was super tasty. 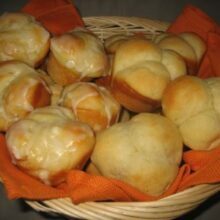 Today I am sharing the orange roll recipe. We kind of cheated though, we used Rhodes rolls since we were short on time. We usually make homemade rolls, but we thought we would give these a try. We let the dough thaw out on the counter and twisted them into knots. We then dipped them in butter and a mix of orange zest and sugar. We let them rise for about 40 minutes and baked them up. We let them cool for a bit and then smothered them in an orange glaze. I usually turn my nose up to store bought baked goods and mixes, but these orange rolls were OH SO GOOD! I loved them! The rolls were light and fluffy and the orange sugar and glaze really made them special. Everyone devoured them. There were no leftovers and we made a ton! I think we will have to make these every Easter! A new tradition! 4. Combine the sugar and orange zest with your fingers. Dip the buttered knots into the orange/sugar mixture. 5. Place rolls in a greased pan and let rise for at least 40 minutes or until doubled in size. 6. Bake at 350 degrees for about 15-20 minutes, until they are golden. 7. Let the rolls cool. Make a glaze by combining powdered sugar, orange zest, and fresh orange juice. Whisk until smooth. I didn’t measure but you want the consistency to be a glaze. 8. With a spoon ice the rolls with the orange glaze. So glad you’re home. Ugh- the flu is the worst! Josh rocks for coming to get you! Glad you had such a nice easter. These rolls sound awesome! I love how big knots in rolls only make them better! These look so good. I’m going to make them this weekend. I’m glad you’re feeling better! Those orange rolls look yummy. These look delicious and I love how they are tied in little knots. 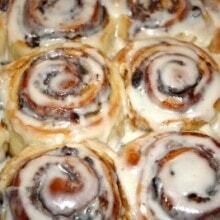 These rolls are so tempting! A flavorful breakfast treat! There is nothing worse than traveling when you are sick. Ugh. Glad to hear you are home and feeling a bit better. What a great idea to put some homemade touches to store-bought rolls. Excellent! I think being in your own home is a medicine in itself! I like how you made them in knots and the orange glaze looks really yummy! So glad you are home! You have a good boss too. Your Easter dinner sounds delicious and those rolls looks so very tasty … mmm!! These look fabulous and wonderful for an Easter celebration. Wait, they would be great anytime. Sorry to hear you have the flu. I’ll keep you in my prayers for a speedy recovery. They look wonderful! Great idea. Sometimes shortcuts are the way to go and surprise you with how good they taste. Hope you feel better! i’m glad that you’re home resting – hope you continue to rest up and get better! you and josh are so cute; i hope that one day i’ll have a husband who is that adventurous in the kitchen, as well. COOKING, i mean. Maria what a great idea to make the knot. They are my favorite looks great. Are you sure you only have the flu????? (Just Kidding) I hope you are feeling better. Happy to hear you are feeling somewhat better. I like the addition of the orange to the rolls. Nothing wrong with frozen heck saves a ton of time especially if they are good quality and you have other stuff you are trying to cook. wow! those look so amazing! I’d add some candied peel to it, or some raisins or something! Oh, I didn’t know you were sick! I’m glad to hear you’re feeling better now! I hope you feel back to normal soon. Frozen dough can be a lifesaver! Glad you got home safely! What a nice husband you have to drive out to pick you up. These rolls are just lovely! I love Rhodes dough! These look great…I’ve never had an orange roll. Your easter sounded fabulous! And those rolls look yummy 🙂 keep feeling better! hope you can start eating a little more today! OMG that is amazing! I have never heard of orange rolls, but that looks incredible!!! I hope you are recovering! Glad you’re feeling better. These rolls look like a wonderful addition to an Easter brunch! Hope you’re starting to feel better Maria!! Those look amazing. I love when orange is incorporated into anything baked. 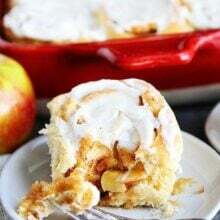 I’m in such trouble when something this delicious-looking is so easy to make! Glad your starting to feel better. I LOVE orange rolls. My MIL makes some killer ones, but we helped once for Thanksgiving and they were LOADED with melted shortening, among other things. They were SO good! Rhodes does sound like a great, easy way to have those yummy rolls! I’m sorry to hear you were sick! I must have missed your last post – it’s been a crazy week! I LOVE Rhodes rolls! Yours look delicious. I know I would love these rolls! I have some Rhodes dough in the freezer right now! Glad your feeling better. Those orange rolls sound divine! I need these, no seriously! They look scrumptious!! Hope your feeling better! Glad you are on the mend. The orange rolls look wonderful! I wish I had a few for dessert right now. I love these adorable rolls! First off, I’ve been craving orange rolls and second I almost bought frozen dough last night and I talked myself out of it- Darn it! Feel better, honey.. I love your shortcut rolls. LOVE them.. Thanks for this.. I can actually make these and everyone in my family will eat them! OH MY GOODNESS!! Those would make me feel better no matter HOW badly I felt! YUM! We had asparagus for Easter. Is the word “asparagus” singular or plural? I would like one asparagui? Oh forget it make it two asparagus? Let me splain something, that I take offense to in your post. “Technically” not family. Josh is my brother…and when you chose to marry him….You just ended up with two sets of in-laws. Besides if your marriage didn’t get you adopted into the Dewey family I think Swimming Pool Blood Basketbrawl sealed the deal. Yummy, these look so good, wish I could have one right now. Thanks for sharing this recipe. It’s one I know we’d love! glad you’re beginning to feel better! Those look wonderful. I hope you are feeling better! hope you’ve fully recouped 🙂 Orange is good because it has Vitamin C, which is good for flu 🙂 I love the glaze on the rolls! I love anything with orange zest added! My kids/hubby love fresh rools so this is must make. So yum! Glad you are starting to feel better! MMMMM, orange rolls. Jon thought you would tease him and write how he ate eight of them! Mmm, I love orange rolls. They’re one of my favorite breakfast (or really, all-day) treats. I need to make these right away; I’m super craving them now. Hope you’re feeling better! I made this rolls this morning for my sister in law’s bridal shower. They tasted amazing, everyone loved them. They are perfect because they are not too rich.